On December 25, 1776, Washington and a small army of 2,400 men crossed the Delaware River at McKonkey's Ferry, Pennsylvania on their way to attack the Hessian garrison of about 900 in Trenton, New Jersey. Washington's final plan was for a three pronged attack on Trenton with his troops at the center. A second column under Lieutenant Colonel John Cadwalader was to cross at Dunk's Ferry, near Bristol, Pennsylvania and engage the Hessian outpost at Mount Holly, New Jersey. A third column under Brigadier General James Ewing was to cross at Trenton Ferry and hold a position just south of Trenton in order to prevent the escape of the Hessian force in Trenton. 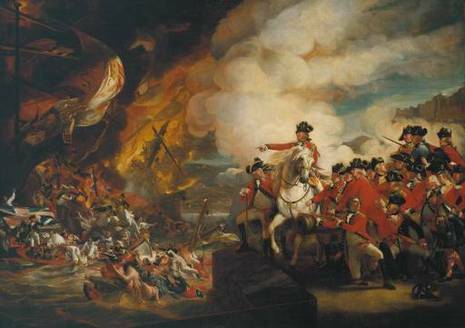 Once Trenton was secure, the combined army would move against the British posts in Princeton and New Brunswick. In order to draw part of the Hessian force away, Washington dispatched Colonel Samuel Griffin and 600 men to pose as a far larger force at Mount Holly. Donop had received reports that a force of 3,000 had been amassing at Mount Holly for an attack on his positions, and he led his force of 2,000 down from Trenton on December 22. Upon arrival, still believing his force faced one of superior numbers, Donop engaged in an artillery duel with the American forces on Iron Works Hill for the next three days, whereupon the Americans vacated their positions. In December 1776, following victories on Long Island, New York City and White Plains, the British army went into winter quarters: mostly in New York, but with some 3,000 men quartered in New Brunswick and Princeton, a holding force of 1,500 Hessians at Trenton, a larger force of 2,000 Hessians and Scotsmen at nearby Bordentown, and smaller companies at Black Horse (Columbus) and Mansfield Square. It was assumed that Washington's forces in Pennsylvania - some 5,000 troops near Newtown, 1,500 at Bristol, and 1,000 manning the defenses of Philadelphia - were also in winter quarters. But on the December 17, Colonel Samuel Griffin, on orders from General Washington through General Israel Putnam in Philadelphia, crossed the Delaware River with 600 men and marched via Moorestown to Mount Holly. His force, largely untrained men and boys from nearby towns augmented by two companies of Virginia riflemen and artillerymen, encamped at Mount Holly and set up a few "3-pounder" artillery pieces on Iron Works Hill. Reports reached the Hessian commanders von Block and von Donop, at Black Horse and Bordentown respectively, that the American force at Mount Holly numbered 3,000 men. By December 24, some 2,000 Hessians had been lured south to The Mount in Mount Holly, where they engaged in a day-long cannonade with rebel forces occupying Iron Works Hill on the far side of the town, south of Rancocas Creek. The Americans evacuate their positions that night and march to Moorestown. The Hessians hold their position, making merry over the confiscated contents of a local brewery. On December 26, the dull thunder of guns echoed from the north. 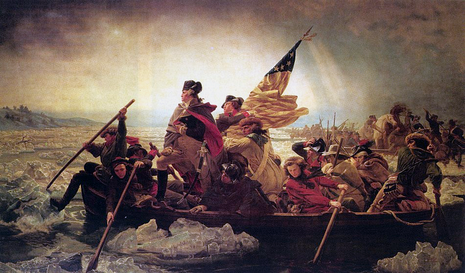 The Battle of Trenton was making history, bringing an overwhelming victory and the capture of 1,000 prisoners. Part of Washington's success can be attributed to the action of the previous week that drew away many of the forces intended to support Trenton.